Rose Milando and Adam Friedman have no conflicts of interest that are directly relevant to the content of this article. The George Washington Department of Dermatology received no funding in support of this manuscript. US Drug Enforcement Administration. Drug scheduling. 2018. https://www.dea.gov/druginfo/ds.shtml. Accessed 11 Jul 2018. US Food and Drug Administration. FDA and Marijuana: Questions and Answers. 2018. https://www.fda.gov/newsevents/publichealthfocus/ucm421168.htm. Accessed 9 Sep 2018. US Food and Drug Administration. FDA approves first drug comprised of an active ingredient derived from marijuana to treat rare, severe forms of epilepsy. 2018. https://www.fda.gov/NewsEvents/Newsroom/PressAnnouncements/ucm611046.htm. Accessed 11 Jul 2018. Shalaby M, Yardley H, Lio PA. Stirring the pot: cannabinoids and atopic dermatitis. Pract Dermatol. 2018;68–70. 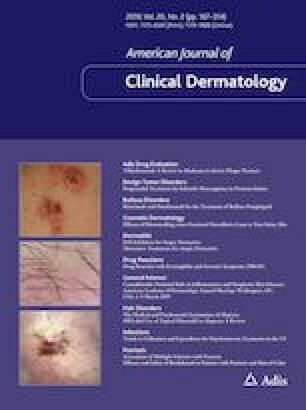 http://practicaldermatology.com/2018/01/stirring-the-pot-cannabinoids-and-atopic-dermatitis/. Accessed 11 Jul 2018. Jakasa I, Thyssen JP, Kezic S. The role of skin barrier in occupational contact dermatitis. Experimental Dermatol. 2018;27(8). https://onlinelibrary.wiley.com/doi/abs/10.1111/exd.13704. Accessed 11 Jul 2018. Safety, Tolerability, and Efficacy of JBT-101 in Subjects With Dermatomyositis—full text view—ClinicalTrials.gov [Internet]. 2018. https://clinicaltrials.gov/ct2/show/NCT02466243. Accessed 13 Jul 2018. A Phase 2 Study of Safety and Efficacy of Anabasum (JBT-101), a Cannabinoid Receptor Type 2 Agonist, in Refractory Skin-Predominant Dermatomyositis. ACR Meeting Abstracts. 2017. https://acrabstracts.org/abstract/a-phase-2-study-of-safety-and-efficacy-of-anabasum-jbt-101-a-cannabinoid-receptor-type-2-agonist-in-refractory-skin-predominant-dermatomyositis/. Accessed 9 Sept 2018. A Phase 2 Study of Safety and Efficacy of Anabasum (JBT-101), a Cannabinoid Receptor Type 2 Agonist, in Diffuse Cutaneous Systemic Sclerosis. ACR Meeting Abstracts. 2017. https://acrabstracts.org/abstract/a-phase-2-study-of-safety-and-efficacy-of-anabasum-jbt-101-a-cannabinoid-receptor-type-2-agonist-in-diffuse-cutaneous-systemic-sclerosis/. Accessed 11 Jul 2018. Trial to evaluate efficacy and safety of lenabasum in diffuse cutaneous systemic sclerosis—full text view—ClinicalTrials.gov. 2018. https://clinicaltrials.gov/ct2/show/NCT03398837. Accessed 13 Jul 2018. A study of tolerability and efficacy of cannabidiol on tremor in Parkinson’s disease—full text view—ClinicalTrials.gov. 2017. https://clinicaltrials.gov/ct2/show/NCT02818777. Accessed 9 Sept 2018. Heineman K. Marijuana may help solve skin rash sting. Inside science. 2018. https://www.insidescience.org/video/marijuana-may-help-solve-skin-rash-sting. Accessed 9 Sept 2018. National Center for Advancing Translational Science. Genetic and Rare Diseases Information Center (GARD). Epidermolysis bullosa. 2018. https://rarediseases.info.nih.gov/diseases/6359/epidermolysis-bullosa. Accessed 28 Oct 2018. Schräder NHB, Duipmans JC, Molenbuur B, Wolff A, Jonkman MF. Combined THC and CBD to treat pain in epidermolysis bullosa: a report of three cases. Br J Dermatol. 2018. http://onlinelibrary.wiley.com/doi/abs/10.1111/bjd.17341. Accessed 28 Oct 2018. Szöllősi AG, Oláh A, Bíró T, Tóth BI. Recent advances in the endocrinology of the sebaceous gland. Dermatoendocrinol. 2018;9. https://www.ncbi.nlm.nih.gov/pmc/articles/PMC5821152/. Accessed 29 Oct 2018. Can cannabis help your eczema? What you need to know. National Eczema Association. 2017. https://nationaleczema.org/can-marijuana-help/. Accessed 8 Sept 2018. A Phase I, Double Blind, Randomized, Placebo Controlled, Maximal Dose Study to Determine the Safety, Tolerability of Topical Cream Containing MGC (Medical Grade Cannabis) in Healthy Volunteers. ClinicalTrials.gov. 2016. https://clinicaltrials.gov/ct2/show/NCT02976779. Accessed 13 Jul 2018.